If ever I came across someone so encouraging to just do your thing, it was Glyn Macey! It's always a bit nerve-racking opening a book on how to paint, as you never know if it'll be easy enough to attempt. 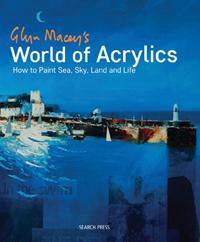 Glyn Macey's use of bold colors really drew me in, and he says, "I am not going to take your hand and lead you through a succession of baby steps..." and "...this book is about giving you ideas, inspiration and new ways of looking at your world—ideas that set you on your own path". This I found wonderfully refreshing. I love seeing artists' work where they toss in everything but the kitchen sink. Glyn does a whole lot of that. Not being a fan of landscapes as it were (I'm a nature photographer and what I see is hard (for me) to translate into my artwork), but when you look at his work, it's not too daunting. It's important for beginners to have a clue as to brushes and techniques, but after that, absorb what you will and off you go. Great advice too, was to pick up and use items around you, truly making unique works. Personally, this book has eased my mind in that I'm now willing to chuck some colors onto some paper and try a few landscapes, such as the ones on pages 66, 109 and 119 (I live in the southwest), and I love the idea of his collages which make some of his work pop! Anyone not sure of themselves as an artist, should take a good look at Glyn Macey's work, as it's so varied and very inspirational. I also love that he "suggests" things and we can take it from there. So much so that I even bought a little roller. Conclusion - Thank you for the freedom to paint what one wants, to use whatever surface you fancy, and to just let go!